Kenya Lionesses beat Argentina 17-12 to reach Hong Kong Semis where they face South Africa at 9:34am Friday 6th, April. Sofia Gonzalez was the toast for Argentina 7s scoring two tries and one conversion. Gonzalez got Argentina rolling with the first try in the 3rd minute but Sinaida Aura Omondi responded for Kenya with a try to ensure the teams were level at the break. 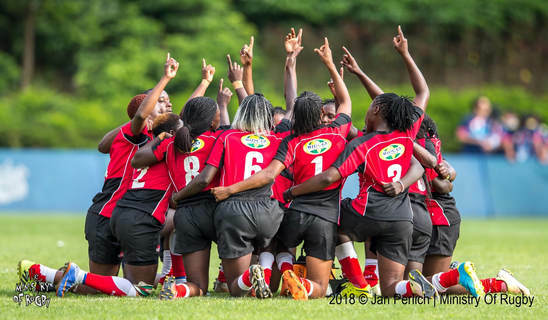 Janel Okelo scored a cracking 101 metre try to put Kenya in the lead ( 10-5) while Doreen Nziwa made it 12-5 with the resulting conversion. The lead was cut short as Gonzalez replied with a try and conversion for Argentina to make it 12-12 to the final normal minute and force a extra time sudden death play. With the teams tied at 12-12 Dorren Remour Nziwa found spaced to race and made no mistake in scoring Kenya's winning try. Kenya Lionesses will now face South Africa at 9.34am at the Hong Kong Stadium.Whenthe two sides met in the qualifier, Kenya Lionesses beat South Africa 24-12.